An Asian-inspired restaurant has signed a lease Fourteenth and Vine Street in historic Over-the-Rhine. The restaurant will be named Hapa, and is rumored to be operated by the same owners as Pho Lang Thang. The five-year, 1,100-square foot restaurant lease is the first major commercial tenant for the Trinity Flats development led by The Model Group, but builds on momentum moving north along Vine Street where residential property has already reached capacity in recently completed developments. A new restaurant called Hapa will soon join the diverse collection of restaurants along Vine Street in historic Over-the-Rhine. 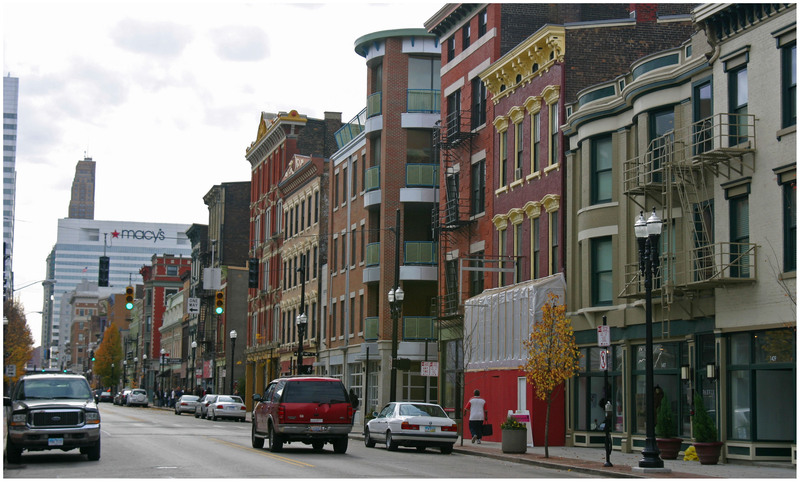 Vine Street photograph by Randy A. Simes for UrbanCincy. The development was a bit of a department for the Cincinnati-based developer. The Model Group has historically focused on rehabs and affordable housing developments. Trinity Flats, however, incorporated new infill construction and included condos averaging $175,000. The results, Maly says, have been better than what could have been hoped for. After Hapa opens there will be just two street-level retail spaces left in the Trinity Flats development which was once viewed as a bold investment in a part of Over-the-Rhine that had yet to prove itself. Construction work is scheduled to begin on the $53.5 million Mercer Commons development later this year, and officials with The Model Group say to watch for an announcement this summer on a new development in partnership with the Cincinnati Center City Development Corporation (3CDC).